Major League Baseball has iconic venues like Wrigley Field and Fenway Park. Lucas Oil Pro Motocross has Southwick. Tucked behind a school in Southwick, Massachusetts, the iconic sand track played host to round six of the championship today. And what a day it was. Eli Tomac had his sixth straight overall in his hands. Until he didn’t. Following an instant classic in the first moto, where he and Marvin Musquin diced for much of the moto, Tomac tossed away a huge second moto lead, and saw his overall win streak end at five. The first moto was fantastic. It had everything you’d want to see. Tomac would charge, only to have Musquin shut the door. He’d regroup, charge again, and Musquin would shut the door. This cat and mouse game continued until two laps to go, when Tomac finally made his move and took over the lead. Musquin tried to make a final charge, but crashed on the final lap and finished a distant second. The second moto had a much different vibe. Musquin had the early lead, but following a bad start, Tomac made a few crafty moves and worked into third early. Then he went to work—quickly. He disposed of Justin Bogle and didn’t wait around this time, passing Musquin for the lead on the first lap. Then came the mistakes. He high-sided while out to a huge lead. Although he remounted quickly, Musquin was within striking distance. Again, Tomac began to stretch out a lead, this time to around two seconds. Then came the mistakes. He went down again. This time, Musquin took full advantage and cruised to the moto win and overall. 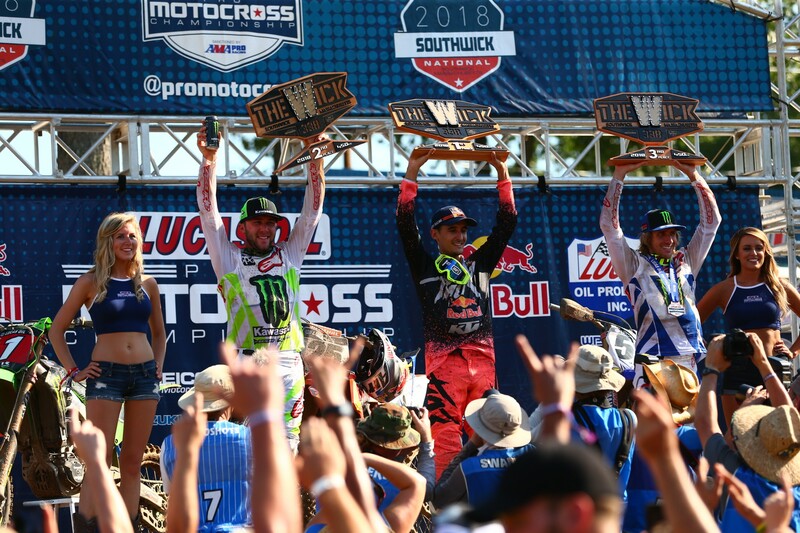 Another race, another overall podium for Justin Barcia. But he’s probably not as happy with this one. Although he finished third both motos, he was off the pace of Musquin and Tomac. Blake Baggett had a quiet today, going 4-4 for fourth overall. Meanwhile, Ken Roczen continues to build. He went 5-5 for fifth overall. Strong day for privateer Lorenzo Locurico, who finished seventh overall behind Benny Bloss. In his first race back, Cooper Webb took eighth. Phil Nicoletti and Weston Peick rounded out the top ten. It’s been a tough year for Mitch Payton and his Monster Energy/Pro Circuit Kawasaki squad. They lost Adam Cianciarulo and Martin Davalos to injury before the nationals even began. Joey Savatgy lost a sure moto win at Thunder Valley due to a mechanical. The team then lost promising rookie Garrett Marchbanks to knee injury at High Point. There was promise today, though. And then the second moto happened. Let’s not get ahead of ourselves though. We’ll start at the beginning. Last week’s overall winner Shane McElrath rocketed out to the lead in the first moto, and was followed by local hero Jimmy Decotis, in just his second race back. Decotis had the New England faithful on their feet the opening two laps. But he made a mistake on the second lap and things began to unravel from there. He finished the moto 20th. The wheels soon came off for McElrath too. He was passed by Austin Forkner. Then Alex Martin. Then Aaron Plessinger. He would drop all the way back to sixth. Up front, Forkner was trying to fend off Martin and Plessinger and grab the first moto win of the year for the team. He stood tall late in the moto and eked out a 1.2 second win, his first since 2016. The second moto was promising for Forkner. He started up front and opened a five second lead. Alex Martin eventually made it into second and went to work. By lap 11, he had cut the lead to less than a second. Then, he saw an opening and went for it. He dove to the inside and ran into Forkner, sending both to the ground. Martin was able to remount quickly and finished fourth. Forkner, meanwhile, had the wind knocked out of him and eventally finished 20th. And the roller coaster ride for Pro Circuit continued. With Martin and Forkner playing bumper cars, Dylan Ferrandis was right in position to take advantage. Ferrandis, who spent years in the FIM Motocross World Championship and the many sandy circuits that occupy the series, was a favorite entering the race to take the overall, but bad starts looked like they would stump his chances. He overcame a bad one in the first moto to take fourth and did the same in the second moto to actually pull within sight of the leaders before the crash. It wasn’t a walk in the park, though. Shane McElrath, who had a terrible second half of the first moto, pushed Ferrandis all the way to the finish in moto two. Ferrandis held on for the win by .8 to claim the moto win and his first overall in the U.S.
What a couple weeks for McElrath. Following a slow start to the season, he picked up his first career overall last week at Muddy Creek. He led laps today and pushed Ferrandis for the overall win. He came up short, but did score his second consecutive overall podium with a third. Another up and down day for points leader Aaron Plessinger. He ran up front in the first moto before making a late mistake and taking third. 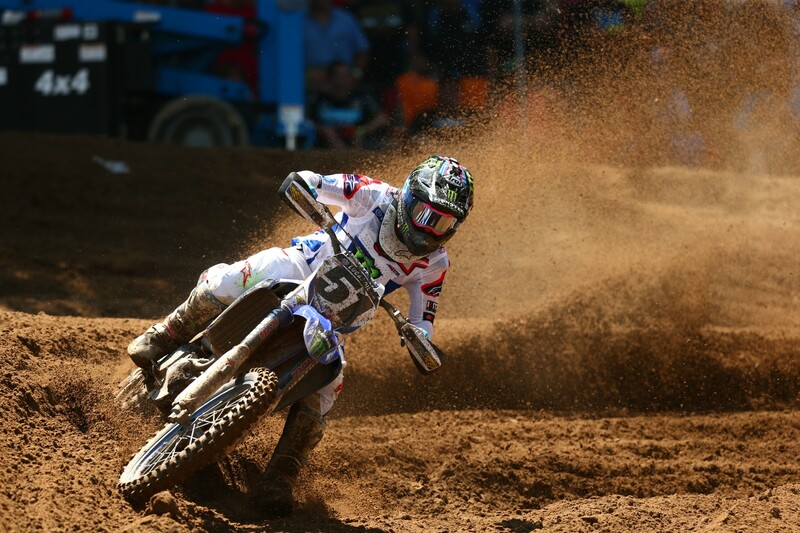 But he struggled in the second moto and finished seventh, which was only good enough for fifth overall. The damage wasn’t terrible in regard to the championship, as he lost just six points to Martin. 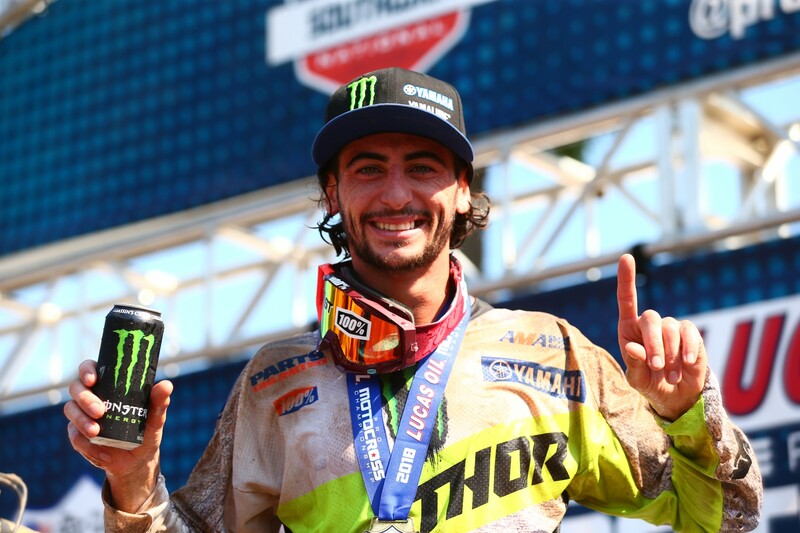 GEICO Honda’s RJ Hampshire had his best day of the year. He was running up front early in the first moto before he crashed in a corner and finished seventh. He rebounded for third in moto two, his first moto podium of the year. His fourth overall finish was also a season-high.